ASVI is a registered non-profit society with a Northern and Southern Chapter and Provincial Council. ASVI evolved in the early 1970′s as a resource to parents with children with vision loss. Its mandate grew to include educational and recreational programming for both parents and their children. ASVI has worked to ensure access to adaptive materials and technology so that students with vision loss have an equal access to the same education as other students in the province. Some of these students have gone on to become teachers, lawyers, musicians among many other professions. ASVI is proud to present that with the support of the Calgary Board of Education and the Calgary Catholic School District the Alberta Regional Braille Challenge 2016! 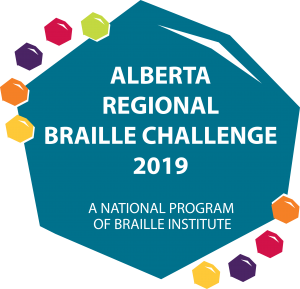 The challenge will take place on Friday, March 8, 2019 at the Kingsland Centre 7430 – 5th Street S.W., Calgary, Alberta T2V 1B1. To register for the challenge please contact Carolyn Malcolm and provide your name, phone number and email.